Hello! 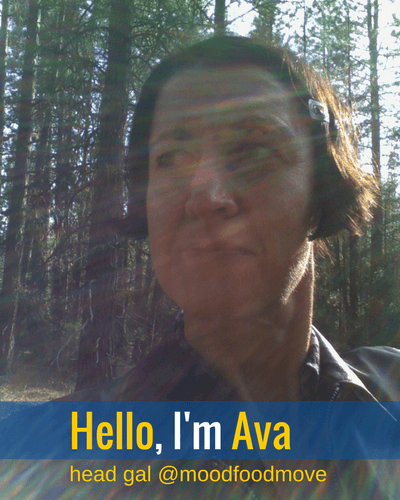 I’m Ava Blass, toolkit-maker extraordinaire – for moodfoodmove. Moodfoodmove is a thoughtfully compiled collection of self-help resources for you to take better care of yourself. 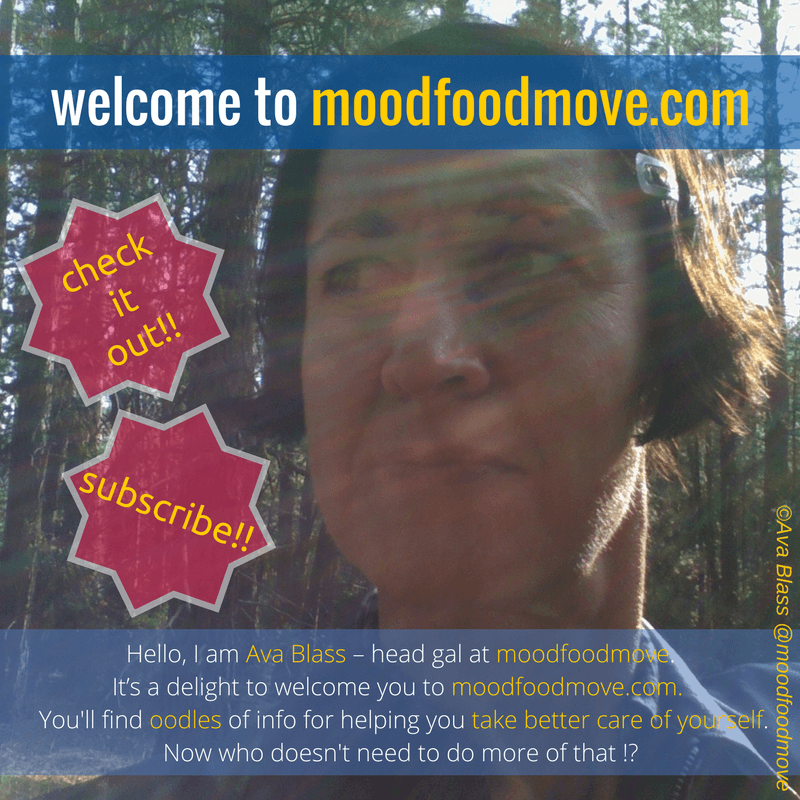 Moodfoodmove will help you get yourself back on track, with practical actionable tools, tips and ideas. 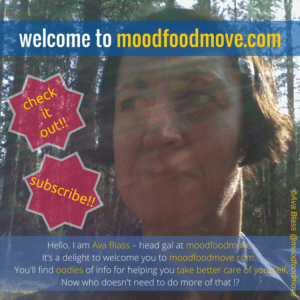 Moodfoodmove wants you to move forward – and not remain bogged in depression. My role within moodfoodmove is to provide the tools and support for you to do this. Do I have a fancy moodfoodmove job title? No. I’m just the captain of this fine vessel. Moodfoodmovers want practical tools. They want reliable information on what they can actively do to help themselves move beyond depression. Moodfoodmovers share many things in common. I suspect we are all experts in making mistakes? And we all have considerable experience in falling off the wagon, failing… and trying again? Another skill we probably share is being adept at lurching from crisis to crisis. Plus, if there’s any possible way to screw up or give up, I can bet we’ve all done so spectacularly. But this is serious: failing is painful. Each time you fail it erodes a little bit of your soul – and you lose a little more self-respect, self-confidence and sense of agency. That’s a rotten way to live. Moodfoodmovers are learning how to look after ourselves better, and keep ourselves stable and happy. For this reason I have gathered together a veritable cornucopia of valuable information, ideas, skills and options to help you back on the right track. My role in moodfoodmove is to make the tools available. Please try the ones which pique your interest. My hope is that you’ll create your own toolkit for staying on track with a healthy lifestyle – and taking better care of yourself. My role in moodfoodmove is to present a vast array of tools, so that you can create your own toolkit for taking better care of yourself. For years I’ve had a rotten time with major depression. It’s been a dogfight. Moodfoodmove directly results from my own search for an easier way to live. The struggle to exercise, eat well, manage stress, work well, and sustain loving relationships is especially tough when you have a chronic mental health condition beating you up. Though it’s been tough I’ve never given up. Everything I have learned from courses, books, workshops, conversations with fellow moodfoodmovers has primarily been to find my own way to sustain a healthy lifestyle. I tried out a vast array of things until I found what worked for me. The wonderful resource which is moodfoodmove is the result. I tried out a vast array of things until I found what worked for me. Moodfoodmove is the result. I spent 15 wonderful years working for the University of Edinburgh – with the last 5 being with their College of Medicine. Because of my fancy Science degree I’m comfortable with research and medical language. Alas my primary qualification is a decade of life experience with major depression – and to have burst forth and created a happy life, underpinned by a healthy lifestyle. I walk the walk. I support this with a Diploma in Integrative Nutrition (IIN); and my fancy first class BSc Hons (UQ). These days we all collect courses, like we once did stamps. I’m no different. I have certificates in Positive Psychology (UNC); Neuroscience for Personal Development (Institute of Neurocognitivism); The Science of Happiness (University of California, Berkeley); The Science of Goal Setting (Udemy – ha! ); and Mindfulness Training (Renaissance Life Therapies). And a Diploma in Cognitive Behavioral Therapy (SNHS). Another little course (no quals) that is particularly valuable was Depression Recovery Program: sleep, energy, emotions (Uncommon Knowledge). I really enjoy that sort of stuff, and find it infinitely fascinating. As someone who loves to learn I am always on a course, of some form or other. Moodfoodmove’s resources will always be growing. The moodfoodmove approach is practical, pragmatic, actionable, tool-based. You can read more about the moodfoodmove approach, and its manifesto.